Processed sauerkraut using one cabbage from the garden. The cabbage was about 920 grams or around 2 pounds. It was cut into small pieces using a borrowed mandolin slicer and a knife. The cabbage was then pressed with a potato masher to release liquid. A few carrots and three garlic cloves cut up was added. Pickling salt 18 grams,one tablespoon, with no additives was added. This was mixed thoroughly. The finale product was stuffed and pressed somewhat into a one liter jar. A red cup was cut off and a hole was punched in the bottom and pressed down on the cabbage insuring the ingredients were covered with liquid. A canning lid was applied loosely. The product was placed in a cupboard and will be left to ferment for about two weeks or longer before using. The cup would appear to be an ideal weight. I tested previously and the color does not leach out. 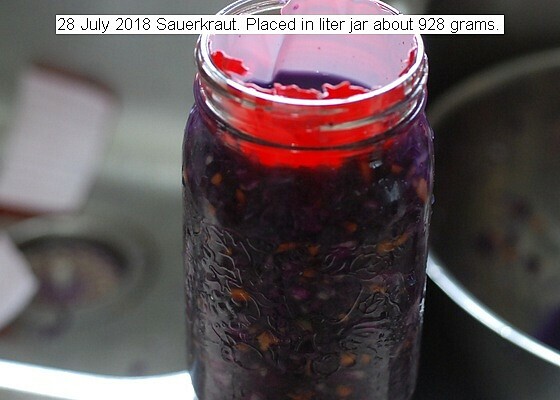 This entry was posted in Uncategorized and tagged 28 July 2018 Sauerkraut, Processing Sauerkraut, Sauerkraut. Bookmark the permalink.